Henry Holt and Co., 9780805065909, 352pp. The idea for this book came to Larry Tye as he traveled overseas as a reporter for the Boston Globe. In each city he visited he was intrigued by a reawakening of practice and spirit of the long repressed Jewish community. And the more communities he saw close-up, the clearer it became to him that the Jewish world was being reshaped and revitalized in ways that were not reflected in what he was reading about the disappearing diaspora and the vanishing Jews of America. The result is Home Lands, an narrative that tells the story of the new Jewish diaspora. Tye picked seven Jewish communities from Boston to Buenos Aires and Dusseldorf to Dnepropetrovsk deep in the Ukraine, and in each he zeroes in on a single family or congregation whose tale reflects the wider community's history and current situation. He met each community's leaders, talked with their scores of young people and old, and went with them to High Holiday services and Sabbath celebrations. The first impression that emerges from his travels is each city's uniqueness. Far more striking than the differences, however, is the unity. Jews all over the world still have enough customs and rituals in common for outsiders to see them as part of the same people, and for them to define themselves that way. It is that new comfort level, that sense of finally feel comfortable in the lands where they are living, that is at the heart of this engrossing book. Readers' eyes will be opened to how Germany, just a generation after the genocide, has the world's fastest-growing Jewish population; how the Jews of Buenos Aires have carved a place for themselves in a land that also gave refuge to Nazi henchmen like Adolph Eichman, and how Ireland is home to a tight-knit Jewish community that, remarkably, has produced Jewish Lord Mayors in Belfast, Cork and, twice from the same family, in Dublin. In Boston, Tye tells the story of his own family, whose roots run deep in the city's Jewish community. 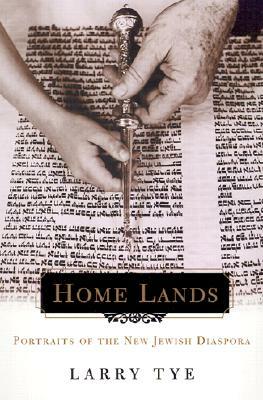 Home Lands is a book that is deeply personal even as it sheds light on the larger Jewish experience. Larry Tye is a medical writer at the Boston Globe, where he has won numerous awards for his work. He has been a Nieman Fellow at Harvard University and is the author of "The Father of Spin" (0-8050-6789-2), a biography of public relations pioneer Edward Bernays.